Photo courtesy of Dan Hunt & Joy Reed. The documentary directors talk about their film, Ren & Luca, which Kickstarter helped launch. When Dan Hunt and Joy Reed began filming Ren & Luca last year, they expected to make a “super short twee piece” about two siblings and a local beauty pageant—but then Donald Trump happened. As he rose through the Republican Party and, eventually, became the President, Reed and Hunt became witness to a family’s fear as Ren and Luca, two transgender siblings, grappled with the changing face of a country that embraced hate over hope. In the early months of 2016 before Reed joined on as co-director, Hunt sat down with Ren, Luca, and their parents, schoolteachers Christian and Shelley, after being introduced through a mutual friend. He talked to them about the commitments involved with filming a documentary project and outlined the narrative. At the time, 10-year-old Ren was preparing to compete in the Lil Miss Westy Pageant as the first out trans-girl with her older brother, 15-year-old Luca, coaching her through the process. For Luca, coaching his younger sister was a natural fit because, years earlier, he’d competed in the Pageant while living as a girl. It was to be a Little Miss Sunshine story of hope and small town ambitions but, with Trump’s election, it turned into a reflection of America’s own transition. Only a year after coming out as trans, Ren and Luca were suddenly thrown headlong into a scramble to legally change their names and genders and, for Ren, go through surgery to have a testosterone blocker implanted. Throughout everything, Hunt and Reed were there to see it all through their lens. 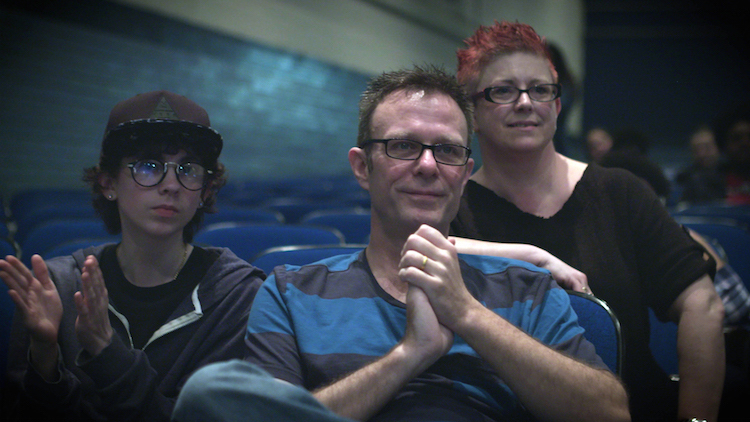 Five years after financing a documentary called Mr. Angel through the platform, the co-directors have returned to Kickstarter to fund the final round of edits for their film in hopes of having it compete in film festival circuits next year. We caught up with duo as they finished up the film to talk about the impact of Trump’s presidency on their narrative, filming queer support groups, and how we can help trans youth thrive. OUT: What was the most emotionally challenging moment for you during the film? Dan Hunt: We were very fortunate to be allowed to participate in and often film a number of queer support groups with Ren and Luca and the parents. These are safe spaces where participants can vent, share, and ask for help, and hearing all the stories of bullying and violence never cease to rattle me to the core. Joy Reed: For me, the most emotionally challenging day was when the kids got their names/genders officially changed. The family had planned to take their time, but motivated by the election, they felt they needed to get their paperwork in order before the inauguration to protect the kids. They managed to get it all done in one day, and I was feeling the stress coming off of Chris and Shelley while trying not to upset the kids any more than they were already. How did the election and Trump shift the narrative for you? DH: We started filming daily life with the family in early 2016, and the kids had only come out within the year prior and were beginning to live full time in their present gender. No one expected Trump to actually get elected so that wasn’t an active part of the narrative during the election—it would come up as a “what if” hypothetical topic with the family when Trump would target transgender folks on the campaign trail to give his base an “other” to rally against. It was scary, yes, but no one thought he was actually electable and actually mean spirited enough to enact some of his hateful rhetoric. With Trump looming as President Elect, the families’ narrative shifted into high gear. They raced to get all of their administrative ducks in a row before he was inaugurated and, since that day, they turn on the TV and open the newspaper with reluctance and fear, but, ultimately, [Trump] unified the family and made each individual stronger. JR: It was going to be a super short twee piece about two siblings and a local beauty pageant with Luca coaching Ren through the process as the backbone of the story. After the election, it became apparent that the story was going to take on more gravity, and that we would need to show more of the family’s day-to-day challenges. Visibility became more important; it’s easy to “other” people when you haven’t met them. Once you get to know this family, you can’t help but fall in love with them. Besides contributing to the project, what else can we do to help the transgender community—especially young trans children? DH: As we saw in the presidential campaign and the more recent actions by the current administration, the trans/queer community is all too often the most targeted group in the LGBTQI family. Trans kids need to be safe and nurtured. The greater LGBTQI family and allies need to step up and ensure that our kids are not only safe, but thrive. JR: Listen to the kids, and accept what they tell you about themselves. When you see transphobic behavior, step up and call it out without shaming anyone. Educate yourself on trans issues, and don’t ask trans folks to do it for you. To help fund Ren & Luca, visit their Kickstarter and for more resources and information on how to help the transgender community, click here.